“The goal of the (backcountry responsibility) code…would be to encourage simple things like speaking up when someone is doing something unsafe….” Outside magazine, article dealing with avalanche safety. “I don’t like this!” I called, and stopped hiking. The day hike we took on the third day of the Wulik Peaks backpack trip was going to be easy. The whole trip had been. 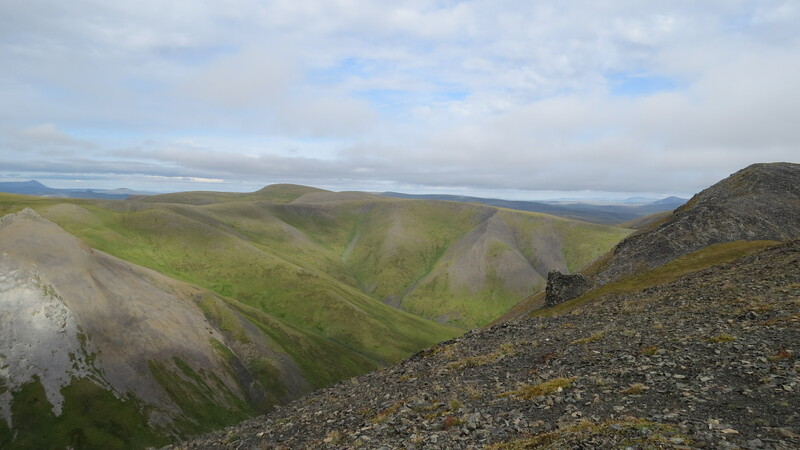 While hiking in Alaska is seldom synonymous with the word “easy,” the abundance of caribou trails, low water in creeks, and hard ground made 2.5 mph possible, triple what I had been used to in my five previous trips to the Brooks Range. My feet had stayed dry, and in my prior 50 days of backpacking in the Brooks, never had I ever finished one with dry feet. We camped early, had lunch, then took a day trip up a long valley, over a pass, into a second valley, climbing to a ridge overlooking two mountains and a beautiful green cirque. The Sun was out, the air clear, the wind light, and the way to the high ridge overlooking our camp easy. People reaching summit of unnamed mountain in fog. This one was safe. Cirque at top of second valley. 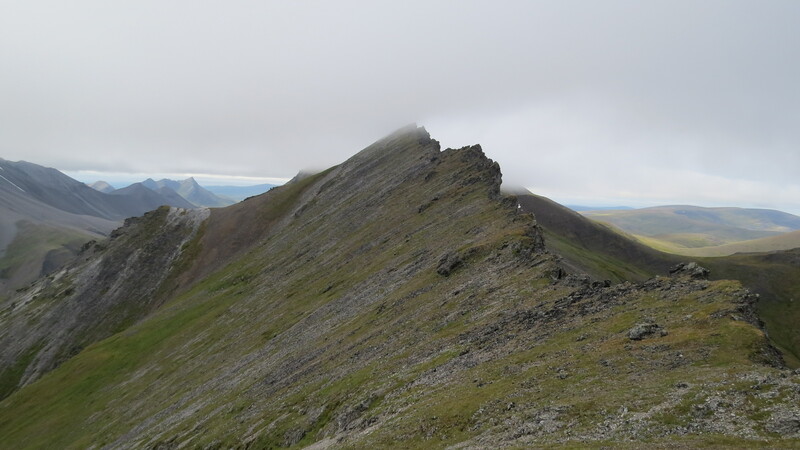 Once on the ridge, however, we realized we had to skirt a large slope of rock scree at about a forty-five degree angle. 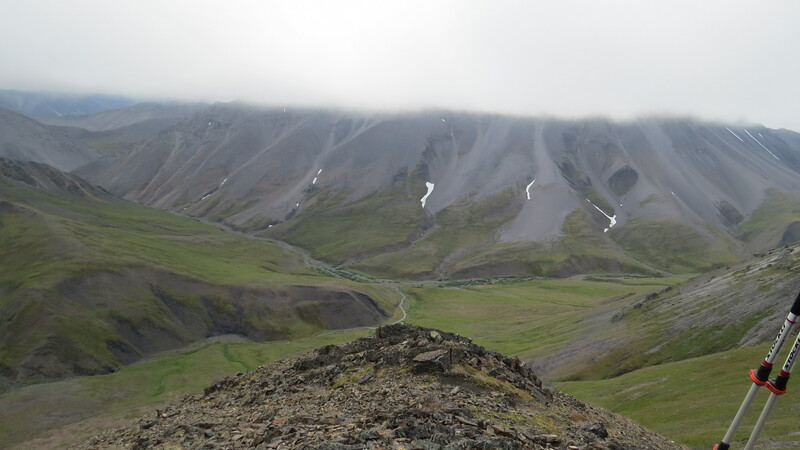 There was the hint of a caribou trail there, but then the guide went one way, and I did not want to follow. I saw no good route, and while falling on the rocks would not likely been considered life-threatening, in remote Alaska, there is no such thing as a “minor injury”. This wasn’t the South Col, but it was more than I had bargained for on this hike. I promise my wife before each trip that I will be careful, and I broke my promise. I got away with it this time, much like the Space Shuttles got away with O-ring problems before Challenger didn’t, on 28 January 1986. The guide called back, “It is only 100 feet around.” A hundred feet means a lot of different things, and vertical vs. horizontal is a big difference. I took it as meaning very short, without considering what modifiers “short” had. Top of the ridge, after the crossing. Where the ridge turned from rocky to grassy. I replied about my not being one of Outside magazine’s world class climbers. Every other person on the trip seemed comfortable, but one offered to go back with me. Against my promise, and therefore against my better judgment, I went forward. I reached the bottom of a 25 foot steep climb up to the guide. I took large steps, stayed close to the mountain, being told by the guide I was going too fast. I don’t like criticism, and I spend most of my life trying to do well to avoid it. I ignored him, wanting very quickly to get to the top. The guide had convinced me to do something I didn’t think safe and then criticized how I did it. I said nothing about the event then or for the rest of the trip. We had been required to hike single-file, and I didn’t like having to set my pace with another person’s. When there are sharp-pointed walking sticks involved, people can easily get hurt, if they aren’t paying attention, and follow too closely. I erred there, too, because I did not mention that problem at the outset of the trip, and I should have brought it up. But the guide and another client had far more Alaska experience than I. After the trip, when I got to a telephone, I told my wife about the incident and apologized. Up on the ridge, I should have turned around and gone back. The fact that I made it safely did not mean it was safe. This concept is poorly appreciated by many, who feel if one “gets away with something,” it is safe. No, one played the probabilities and succeeded, but the probabilities significantly predicted a bad outcome, and we read about those in newspapers. In the Alaskan bush, one has already taken significant risks. There is simply no reason to cross a potentially dangerous ridge that does not need to be crossed. Going back around would have been safe and taken 30 more minutes. Big deal. But we didn’t do it. I didn’t go back; I got caught up in “Group think,” and I didn’t want to disappoint anybody. As it was, I felt like I was the worst hiker on the trip, as if it mattered, as if I were going to see any of these people again. I disappointed myself, breaking a promise, because of a bunch of rocks. The guide erred, and I erred, too, by not pointing it out to him. He should have told me to turn around, rather than say, “It’s good that you know your limits” before making me violate them. He should have decided to either have people look before proceeding or deciding on his own not to do the traverse. 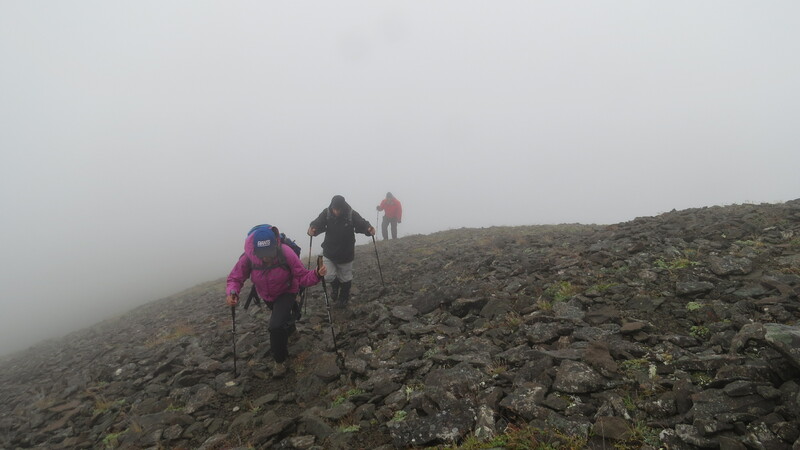 That is what a guide really gets paid for, not for cooking a meal or leading a single-filed group of 6 on caribou trails in northwestern Alaska. It is one thing to know a person’s limits. It is quite another to respect and not violate them. I suspect the rest of those on the trip have either forgotten the incident or thought I was a sissy. I didn’t make a stink. I moved on. But I didn’t forget it. If I am a sissy, so be it. I’m alive to hear the words. Many of us don’t like to say anything negative on a subsequent survey, especially if either our name is known or our identity obvious from the response. Those who survey should remember that their questions may not capture significant complaints. People must feel safe to report problems, straddling a fine line between wanting to state their case without getting somebody in trouble with their bosses, many of whom do not have the gift of constructive criticism. I did not feel safe commenting. The guide erred. I erred twice, when I didn’t turn back and when I did not discuss the issue with him, out of earshot of others. That would have been best. It is one matter to wrench a knee during a necessary stream crossing; it is inexcusable to risk injury on a day hike to a ridge. The former is a significant problem, but stream crossings are a necessary part of Alaska hiking. Crossing hazardous ridges on day hikes were not necessary on this trip. Had I fallen and broken a few ribs, at 65, my life would have been in jeopardy. Day hikes are not necessary; often, they are treated with less, rather than more, care. I regret my silence and not turning around. Fortunately, I am alive to regret it. This entry was posted on September 14, 2014 at 16:09 and is filed under 2014, ALASKA TRIPS. You can follow any responses to this entry through the RSS 2.0 feed. You can leave a response, or trackback from your own site.